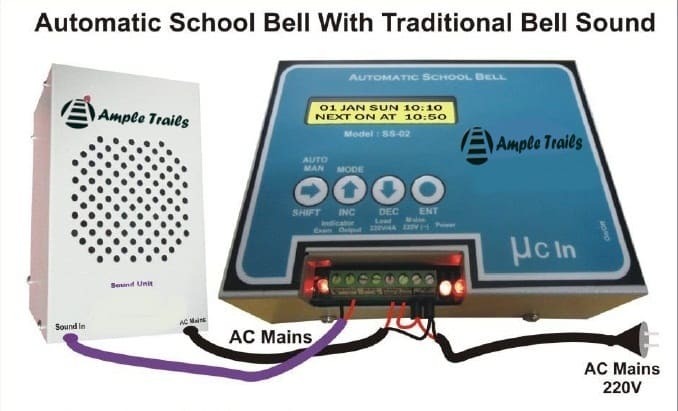 APPLICATIONS of Automatic Ringing Bell: Schools, Colleges, Education institutes, coaching institutes etc. 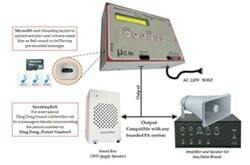 Use full: System fully relieves the person responsible to ring the bell at an accurate time. It is fully automatic. 1. Display: 32 Character digital display to show current date, time in the first row and next bell time in the 2nd row. 2. Stand alone machine, no computers required to program or maintain the ringing schedule. 3. Output Devices: Any electrical device like, bell, hooter or siren can be connected. 4. No battery required to maintain clock and stored program. a. APNB model system rings the bell once for period No.01, Twice for period No.02 and so on. For assemble, interval and school off single shot long bell are rung. So with this, you can distinct the period number. b. APB Model bell rings single shot once only. The user can set the ringing duration between 01 to 99 seconds. 6. Modes: 05 Modes of operation (summer, winter, Unit Test, Examination and Spare mode) to cover all seasons of the year and special events like sports, examination, annual functions etc. 30 bells per day can be programmed in each mode. This is enough for two shift schools round the clock throughout the year. 7. Weekly off: any day of the week can be selected as weekly off. 8. Monthly off: any date of the month can be selected as monthly off. 9. Half day: Any day of the week or any date of the month can be made the half day. 30 Bell can be programmed. 10. Second Saturday: User selectable second Saturday option. 11. Time accuracy is maintained in microseconds. 12. 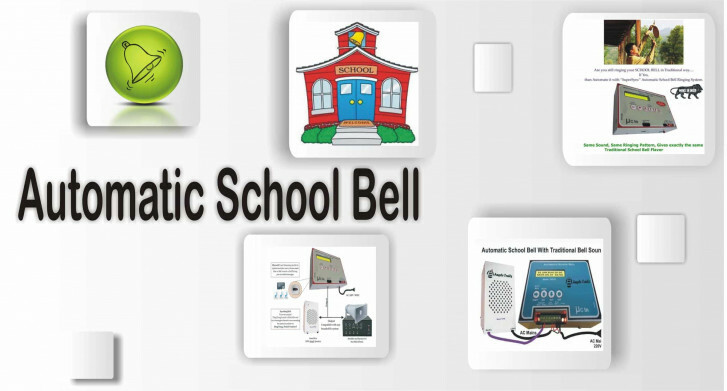 Connect multiple number of electronic bells: to bring all areas of school in the audible range. With one electronic bell, 70 to 100 Meter area is covered. Up to 10 electronic gong bells can be connected directly on the control unit. All of them will ring simultaneously. Weight:Control Unit : 1 Kg and Electronic Gong Bell: 1.5 Kgs. Dispatch of material: We dispatch material by courier. And all charges of forwarding material are on your accounts. Payment: 100% Advance (We have never diluted this condition under any circumstances; we dispatch material on getting clear credit in our accounts). Email us at info@ampletrails.com or call us at 9315441053, 9818390836 for more info. 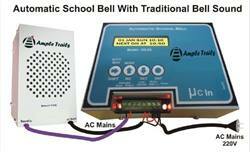 Special discount offers for the schools and re-sellers want to have Automatic School Bell.